WSU Chelan-Douglas County Master Gardener volunteers like to get our hands dirty. The Master Gardener Program assists WSU Extension to promote environmentally responsible gardening practices and addresses environmental and social priorities such as water conservation, the protection of water quality, reducing the impact of invasive species, and healthy living through gardening. Master Gardeners are trained by Washington State University in topics such as botany, weed identification, soils, lawn care, pruning, pesticides and insect management, plant pathology and plant problem diagnosis, and sustainable gardening practices. Are you interested in becoming a Master Gardener? Read more. 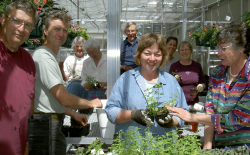 Our Master Gardener program and projects are made possible with financial support from the Master Gardener Foundation of Chelan County, a 501(c)3, charitable organization. Help support our services with your donation, tax deductible to the extent allowed by law.